Today I want to talk about employee attendance. When you run your own business, you might feel like you spend a lot of type firefighting and solving workplace issues as they arise. Whether it’s dealing with an underperforming employee or interpersonal conflict, the buck stops with you, and like many workplace issues, some have a more significant effect on a small business. Absenteeism is no exception. While it’s true that people get sick, emergencies happen and you should make allowances for this, if absenteeism becomes a habit, it has to be dealt with. Once it becomes a habit, or it’s seen as an accepted behaviour, it can be more difficult to deal with. So what are the effects of absenteeism on business performance? Firstly, employees who are frequently absent become a financial burden, whether it’s because of reduced productivity or the cost of bringing in someone to replace them temporarily. Their absence also affects morale when other employees are burdened with extra work. Absenteeism also affects continuity. It can be hard to continue business as usual if you have to hire temporary staff and you’re unsure of their exact skill set and how quickly they will adapt to your ways of working. I spoke about how absenteeism affects the morale of other employees; it actually does more than this. It can reduce the performance of other employees who might resent the fact that the absent employee is ‘getting away’ with being absent so frequently, and they might even try to play the system themselves. But the absent employee can actually harm their career by being absent. An employee is hired because of their qualifications and experience, which in most cases, they are expected to develop in their time with the business. How much can a frequently absent employ be expected to develop in a way that will help your business grow? Finally, absenteeism is a common cause of workplace conflict. If some employees are disgruntled at having to cover for others all of the time, this can cause open conflict and resentment. This can make for a tense and much less productive working environment. How can you deal with attendance issues? The first step is to make sure you have an attendance policy. You might not have a big HR department to deal with these issues for you, but you can put down in writing exactly what you expect in terms of attendance at work, the procedure for reporting an absence, and the procedure for dealing with frequent or chronic absence. In the policy, deal with different types of absences like sickness absence, scheduled absence (for an operation for example), unauthorised absence, and absence in special circumstances such as bereavement or a family emergency. Mention procedures for requesting or reporting an absence and also disciplinary measures that will be taken if appropriate. Make sure the policy is written clearly, it doesn’t need to be complicated. Your attendance policy should be readily available for employees to read, and they should sign it to say they have read and understood it. Make sure they know that attendance is a shared responsibility. But it’s not enough to just have a policy filed away in a ring binder somewhere, make sure that you enforce it. Enforcement doesn’t mean that you can’t show some empathy when someone’s child falls ill, but make provision in the policy for situations where ‘emergencies’ become a regular occurrence. For example, you could state in your policy that you’ll have a review meeting with an employee who is absent for an emergency twice in a short space of time. The next important thing is to keep track of absences. It’s a good idea to use a time-keeping system, an employee performance tool, or a spreadsheet which allows you to see absences at a glance. This will help you to see if one-off absences are becoming a pattern. Make sure you record the reasons for absence too as this will help if you have to resort to disciplinary action. Emergencies can happen and employees can need time off at short notice, but if an employee simply doesn’t turn up for work, address the issue as soon as possible. Try to establish communication with them and when they return to work, meet with them to talk about what happened and what is expected of them if they need time off in the future. If necessary, decide on an action plan with them which will help reinforce that you have noticed their absence or absences and that it impacts negatively upon the business. If you do notice patterns of absence like if an employee calls in sick frequently on a Monday or a Friday, confront them with your documented evidence and try to find out why their absences fall on certain days. Don’t be accusatory. Go in with an open mind; there might be a valid reason why an employee calls in sick on certain days. Do they have trouble getting childcare on certain days, or do they have caring responsibilities for a relative? Work with them to get to the bottom of it. Could you do anything to make their working hours more flexible? It can be more difficult to accommodate needs when you’re a small business, but it can be worth the effort if it helps a valued employee. Remember too that it’s not just about punishing poor attendance, rewarding good attendance and performance is important. When employees feel appreciated, they tend to work harder for the business and stay loyal. Why not start a quarterly attendance reward scheme, where those with the best attendance get some kind of token to show they are recognised and appreciated? 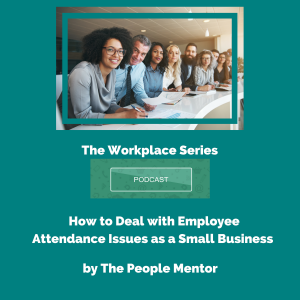 Dealing with attendance issues is never easy and you might not be able to prepared for every potential attendance scenario, but if you have a clear and fair attendance policy, track attendance patterns, address absenteeism promptly, have a plan of action for excessive absence, and reward good attendance, hopefully you’ll see a marked reduction in absence which affects your bottom line.